Being so flat, Koh Mak is ideally suited for exploring by bicycle, on foot or if need by, by motorbike. To this end, the island authorities created a network of signed trails, paths and roads, with an accompanying simple coding system of A, B or C, alongside a number. When you are out and about you will see the small concrete posts with their dual language information snippet. There was a booklet which accompanied this network but sadly, most copies seemed to have disappeared. Stiil, even without the booklet, it is easy enough to set off along a trail and see where you end up. You are unlikely to get lost but bear in mind that is gets dark at 18.30, so leave yourself plenty of time to get back to your starting point. Within a few hundred metres of leaving Ao Suan Yai from the back of Koh Mak Resort pier, a small road on the left hand side, marked for Happy Days, leads off into the forest. Almost immediately, it passes the path to The Kingdom of Somchai, a surreal and very graphic collection of sculptures, in a papiermâché-like style, of naked women. These figures are posed as tables, as water spouts, as chairs or just standing, bending and kneeling, with nothing left to the imagination. A brief explanation of the artist and his inspiration is found on an accompanying board by the entrance. The sculptures are also dotted by the roadside elsewhere on the island and in particular, two or three stand or bend around the main Koh Mak sign near Ao Nid pier. After continuing on for another few hundred metres, the road curves back onto the beach and arrives at Luang Prompakdee House. There’s not much to see now as the house has been renovated and modernised so losing much of its charm, but historically it remains the oldest building on the island, dated around 1910-1911. On foot, if you cut down onto the sand, past Happy Days and continue towards the end of the beach, a sign on a broken tree bough indicates where you should turn in for Turtle Beach. 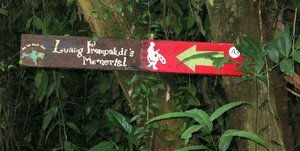 Unfortunately, this sign frequently gets washed away, so if you cannot see it, just head in about 300 metres before the end and pick up the clear path to the left through the coconut trees. Follow this and keep heading north. As a marker, you’ll pass a gnarled heavily rooted tree at one point and you will find the water’s edge and mangroves will switch to being on your right. After a good 10 minute walk, you arrive at Ao Tao Kai (Turtle Beach), a perfect place to take a dip, cool off and more than likely, be totally alone. 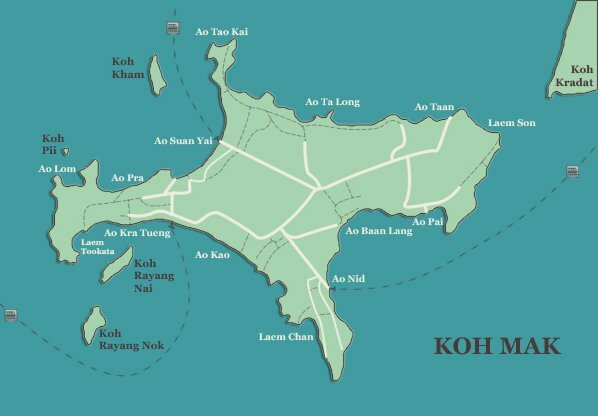 The original communtiy on Koh Mak is still based on the northern coast at Ao Ta Long. To reach it, head out the back of Koh Mak Resort pier, up the straight road to the crossroads and take a left. 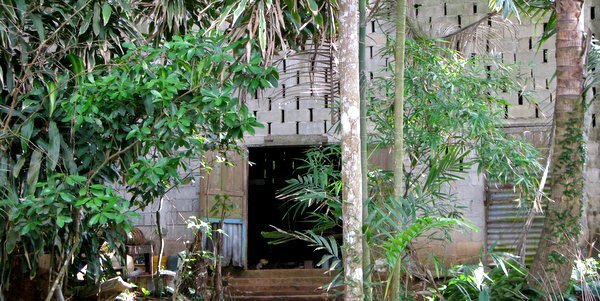 After a couple of kilometres of good road, you reach the wooden ramshackle houses dotted about under the trees or down by the water. There are rubber drying sheds, a unique collection of stilted houseboats high up in the air, lots of chickens and dogs but above all, it’s a fabulous and unique glimpse of a truly authentic Thai island village. If you go straight through the village to the end, you can pick up the start of a track into the forest. This follows the Ao Ta Long coastline to the northern end and ultimately links up with the trails network at the top of Ao Suan Yai Beach and Turtle Beach, as described above. Still further east along the northern coast, another trail begins at Green View Resort at Ao Taan, which, after a 30 minute walk, joins the road above to Ao Ta Long about half way along. When you emerge onto it, you want to take a right and you will end up at the old village. To get to Green View Resort, follow the Ao Suan Yai road from Koh Mak Resort pier to the crossroads and proceed straight ahead, with the turning for the resort found after 4 to 5 kilometres. This is the same crossroads where a left would take you to the pioneer village, again as described above. Just by the turning to Green View Resort, the main road curves to the right towards Ao Pai in the north east. Taking this, you pass through a lovely avenue of rubber trees and then high above Plubpla Resort, before reaching the turning to Little Moon Villa. Before Little Moon Villa, there are various other concrete roads leading down to the sea which you can shoot down and explore – little coves, local houses or one where you can get up and over the hill to look back down Ao Pai towards Ao Baan Lang. The island on the horizon is Koh Kood and look out for the extraordinary shrine, filled to bursting with dolls. if you continue on to the end of the road, it becomes a sandy track through the coconut trees which emerges out on the wonderful deserted beach, Laem Son, with its views across to Koh Kradat. As is the excellent Thai way, food is on hand with the Laem Som Somtam serving up exactly that from its coconut wood shack, along with grilled chicken and pork, sticky rice and cold beer. You can also charter a boat across to the island from the shack on the side, 350bt per person with entrance fee included. When you leave Laem Son, behind the main somtam shack, you can head out on the 2nd trail which heads to the right. Follow this until you reach a couple of houses in a clearing in the forest and here bear to the left on the 200 metres of crazy paving until you hit the dual rubber tree tracks separated by the barbed wire. Follow this for a couple of kilometres to the end and you can either turn left back to the main road coming out just after Little Moon Villa or turn right and follow the trail right to the end through the forest. You emerge on the access road to Cinnamon Art Resort on the Ao Taan north coast. The south western peninsula at Laem Tookata is another good spot for exploring, with more trails, a charming little beach and viewpoints. To get there, head out from the back of Cococape Resort on the Laem Tookata route. The road, great for cycling, passes above Ao Pra Beach, where the new boutique Mira Montra Resort has now opened and past the backs of a few villas, before its wends its way over a couple of kilometres down towards the end. Just before the final section, another road leads off behind the beach all the way to the headland, Here, you’ll can look back down the island to Ao Kao and over to Koh Rayang Nok and Koh Rayang Nai offshore. You can also shimmy up the hill to drop down into a cute deserted cove on the other side, a very pretty spot used by fishermen (hence the rope). Unfortunately, it also testament to the scourge of discarded plastic – the amount of odd flip flops, in particular, is staggering. Meanwhile, if you continue on to Laem Tookata beach itself, you can get a drink or food at one of the three small backpacker style bungalow resorts, Baan Ing Kao perhaps the pick of them. Over on the south east coast, another inter-connected set of small roads makes a good diversion, with a chance to get to the island’s most southern point, where an abandoned restaurant battles the elements above Talay Time. Here, too, the views are fabulous with Koh Kood in the distance. Nearby, Pano Resort sits below a curious folly of an old crumbling resort, optimistically built for hundreds of guests, none of who turned up. From here, you can trace your way back along disused roads and tracks all the way to Ao Nid Pier emerging you at the cafe, Coffee and Sweetcake. Located by Joe’s Corner Hostel in the middle of the strip behid Ao Kao Beach, Ball Cafe has lots of useful tips for exploring the island. The tourist offices at Makathanee Resort or Koh Mak Information Point by the pier at Koh Mak Resort are also possible outlets to get your hands on one of those trail booklets. Bikes and mountain bikes are now available from 150bt to 250bt a day from many resorts and other outlets. Makathanee Resort, Ball Cafe and Coco Cafe at the top of the road down to Ao Kao Resort all have a decent selection, but if you really want to explore the island, pay the money and get the best mountain bike they have – the ordinary pushbikes are simply not suitable. Motorbikes are from 250bt to 300bt a day, excellent to explore almost all of Koh Mak, but they will not be able to drive them down some of the tracks on the north coast.